With the presidential election happened on Tuesday, November 6, 2012, this is the perfect time to build an online fundraising campaign for your candidate of choice. Regardless of whether you support Barack Obama or Mitt Romney, DonationTo.com is the perfect way to raise money online while also raising awareness. Although the presidential election only happens once every four years, you can also use DonationTo as a platform to encourage people to donate online to show their support for any governor or senator, along with other elected officials and any bills that require votes to get passed. One of the most important aspects of any online fundraising campaign is easy accessibility. For example, if someone is interested in making a donation but the website will not load on their iPad, then they are most likely going to end up forgetting to return to the page at a later time to donate online from their computer. DonationTo provides a fundraising platform that is streamlined for easy viewing and usage on computers, smartphones and tablets. By doing this, DonationTo ensures that all of your potential donors will be able to donate from any of their web enabled devices, and this will increase the total amount of donations that you receive. Utilizing the proper technology to support online donations is the first important step for a political fundraiser, but you will also need to provide reasons that people should support your candidate of choice. Consider for instance how many people you know in your life who are either still on the fence or who are not very interested in politics. Keep these people in mind when you are building your fundraising page. Just as you needed to do at least a little reading to understand how to fundraise, many of the people who visit your fundraiser will need to read some facts to help them make a voting decision. The DonationTo platform enables you to upload photos and biographical information, so you can utilize this to help inform potential donors about the candidate that you are backing. Make sure that you also include a statement about why you are supporting this particular candidate. Putting a specific plan in place will, with a deadline, help you raise money online more effectively. For example, think about any time that you have considered buying a specific item that was on sale. If the sale was going to end at a set time, then you probably felt a sense of urgency that compelled you to make the purchase quickly. On the other hand, if it was advertised as a new lower price with no specific end date listed, then you most likely ended up forgetting all about it. One of the most important steps of learning how to fundraise is creating a sense of urgency. By putting a deadline in place that includes how much you need to raise by a specific date, you will be able to build a fundraiser that is properly designed to help you hit your goal. Most people who lean a certain way politically will also associate with like-minded people. Consider for example all of the things that you have in common with your closest friends. You most likely enjoy similar movies and music, and it is almost a certainty that you will have similar social views. One of the easiest fundraising ideas is to encourage your donors to spread the word about your efforts to raise money online. Ask them to share the link to your fundraising page to help you make a bigger impact for the candidate that you support. Always keep people informed throughout the fundraising process. For example, consider how much more engaged you feel by anything when you hear about it on a regular basis. This is how Hollywood gets people excited about seeing upcoming movies, and you should utilize the same approach. By keeping all of your donors in the loop about your progress, you will encourage them to donate throughout the beginning, middle and end process of your campaign. Most people will increase their donations if a cause that they really believe in is close to becoming fully funded, so follow-up with your donors near the end and ask them for additional support. Before you launch your political fundraising ideas, make sure that you check with your local and federal political fundraising laws. Just as some Olympic athletes have found themselves stripped of their medals by violating an Olympic rule, you are also subject to following all applicable laws. By reviewing your city and state fundraising laws, along with the federal laws for a presidential election fundraiser, you can ensure that your fundraising efforts are in compliance. Keep in mind that there are rules regarding who can give and how much they can give. 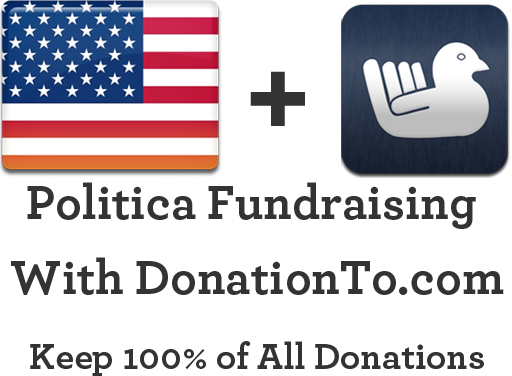 DonationTo provides an online fundraising platform that can easily be used to raise funds for a presidential or other political candidate. Each of DonationTo’s fundraising pages is optimized for viewing and usage on multiple different devices, and this ensures that you will receive the maximum amount of donations. Use your fundraising page to let people know why you believe in your candidate of choice, and ask donors to spread the word to like-minded friends. Keep your donors in the loop throughout the process to maximize your total donations. Make sure that you review local and federal political fundraising laws to host a fully compliant campaign. The political crowdfunding has been proved to be achievable and of great importance via our donation website. To crowd fund for a political campaign means to support the political framework of the country overall.